Each year from November to March, eastern Canadians embrace winter with festivities and outdoor adventure. Join in the fun, as you explore three historic cities blanketed in snow and ice. Spend a day at Quebec City’s Ice hotel - an architectural wonder made entirely of ice and snow. Or join locals on their way to work, as they skate along the Rideau Canal in Ottawa. If you time it right, you can partake in festivities of two winter events – Carnival De Quebec or Winterlude in Ottawa. See night parades, snow sculptures, sample traditional Canadian cuisine, and much more. In Quebec, Montreal and Ottawa, join a local guide to learn more about Canada’s history, culture, and culinary scene. Welcome to the capital of Canada! Don’t let the assumption that this is a bureaucratic government town fool you – Ottawa is a hub for culture and history and has a definite hidden flair. The capital city is home to seven national museums that recount the tales of Canada’s colourful past, a thriving restaurant scene, and plenty of stunning historic buildings to explore. Ottawa has an abundance of attractions no matter the time of year! You will be met by your own private driver and vehicle to make your way in comfort from Ottawa Airport to your downtown hotel. Overnight at The Fairmont Chateau Laurier. The prestigious Fairmont Chateau Laurier is situated just across the water from Parliament Hill and overlooks both the Ottawa River and Rideau Canal. Find yourself within walking distance of some of Ottawa’s most well-known attractions including ByWard market, Notre-Dame Cathedral Basilica, National Gallery of Canada and the Royal Canadian Mint. Dubbed “Ottawa’s Castle”, the luxury hotel features a health club complete with art-deco swimming pool, an elegant restaurant and lounge, and on-site gift shops. Ottawa is a hub for culture and history, as well as various creative and entertaining things to do in the city for visitors and residents of all ages. Ottawa has an abundance of attractions no matter the time of year. With a third generation Ottawan as your guide, enjoy an immersive tour full of anecdotes only a local would know! This tour visits the top sights around Ottawa, including Parliament Hill, the Ceremonial Route, government residences, and Rideau Hall. This tour is fully customizable to your interests - from photography to food, your guide will show you the best in Ottawa! There’s nothing quite like exploring a city on a culinary adventure! Explore little known spots in the city’s most historic district and meet the chefs, producers and food artisans while experiencing the Market the way the locals do. Of course, you get to sample tasty offerings along the way so bring an appetite. Stretch your legs on this privately guided walking tour where you visit the historical highlights of Ottawa located in the downtown core. Hot spots include; Parliament Hill, the National War Memorial, Sparks Street, the Fairmont Chateau Laurier and the ByWard Market. Today offers you more time to enjoy Ottawa at your leisure. 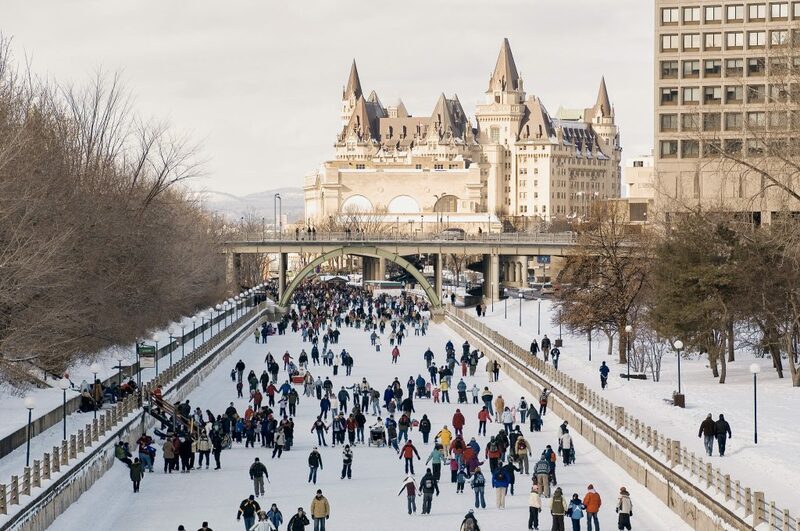 Head to the Rideau Canal for a day of skating right on the frozen water (you can’t get more Canadian than that), head to Byward Market for souvenirs and tasty treats, or visit any one of Ottawa’s seven museums. The National Gallery of Canada comes highly recommended and is home to a permanent Canadian collection and often features exhibitions by Canadian artists. You will be met by your own private driver and vehicle to make your way in comfort from your Ottawa hotel to the train station. As the train rocks and sways out of Ottawa, you will start to notice more and more French words floating in the background. Enjoy the scenery as you look out at Quebec's open farmland, chat with old friends and new or dip into a book. This is what train travel in Canada and being on vacation is all about! You will be seated in a spacious business class seat. Enjoy exclusive access to the in-station business class lounge before your trip. Food and cocktail service is included. A private driver will pick you up at the train station and take you to your Montreal hotel. Overnight at the Fairmont Queen Elizabeth. Built by the Canadian National Railway, this deluxe Fairmont is considered a social hub in Montreal and has hosted countless famous dignitaries. The Fairmont boasts high-end, contemporary décor and a wide-range of amenities, including an indoor pool and health club, beauty salon, and fine dining restaurant and bar options. The hotel is located right above the VIA Rail and AMTRAK rail stations and is connected to Montreal’s underground shopping area. In Montreal, the winter chill adds to the atmosphere as frost blurs bistro windows and snowflakes sparkle against glittering skyscrapers. This fairytale French Canadian hub comes to life like an idyllic Christmas village each winter. Staying in such a food centric city, we wanted to give you a chance to sample some of the best cuisine. We've included a dinner tonight at one of our favorite Montreal restaurants. Discover Montreal on a private tour tailored to your interests. By vehicle, choose to visit historic Vieux-Montreal, beautiful Mont Royal, the bohemian Plateau neighbourhood, the city centre, and more. Discover the cultural and culinary charms of historic Old Montréal, guided by a passionate local foodie. Sample Montreal staples such as smoked meat, pâtés, and much more. Explore the winding cobblestone streets of Old Montreal on a privately guided walking tour. Travel back in time to Fort Ville-Marie in 1642, to today’s modern city and find out more about all the eras that shaped Montreal. Continue to enjoy Montreal at your leisure this morning. Stroll down the cobblestoned streets of Old Town to explore the art galleries and capture a few more pictures. The unique winter atmosphere of this city is something to appreciate. Later today you will head to Quebec City to discover more of our Canadian history and culture. A private driver will pick you up at your hotel, and take you to the train station. Travel by train to the city the French and English battled over so fiercely. Enjoy the scenery as you pass through charming towns and farmland. Step off the train into Quebec City, where your surroundings are filled with old stone buildings, cobbled streets, Quebec’s distant mountains, and a wealth of history and culture. You will be seated in a spacious business class seat. Enjoy exclusive access to the in-station business class lounge before your trip. Food and beverage service is included. A private driver will pick you up at the train station, and take you to your hotel. Overnight at the Fairmont Le Chateau Frontenac. Dubbed the “heart of old Quebec”, this prestigious accommodation overlooks the St. Lawrence River and the city beyond. Experience the hotel's enchanting history with the finest modern luxury. During your stay, enjoy a full range of amenities including multiple restaurant and bar options, a business center, indoor pool, and a state-of-the-art health club and spa. Spend a full day discovering the beauty of a wintery Quebec City, with its French-Canadian culture. Marvel at the beautiful architecture of the fortified city, visit historic sites commemorating the battles between the French and the English, and discover the many warm and cozy local shops and galleries. Relax in the comfort and convenience of a vehicle with your local private tour guide. At Fresh Tracks Canada, we pride ourselves on finding the best local guides so you have the most memorable and informative experience. Witness history first hand and hit all the top spots including the Chateau Frontenac, the Latin Quarter, Ramparts, and the Plains of Abraham. On a guided walking tour, taste the local specialties of Old Quebec. Taste beer, wine, chocolate, cheeses, pastries, crepes, maple products and savory tidbits from a variety of vendors, including Old Quebec's renowned restaurants. Explore the cobblestone streets of fortified Old Quebec, a UNESCO World Heritage site. Your guide will take you through 400 years of history, and give suggestions on what to do next in Quebec City. Quebec City is truly a winter wonderland. With Christmas Markets decorated with enchanting snow-covered lights in the holiday season, to the world’s biggest winter carnival, Quebec City is a world-class destination throughout the entire winter season. Travel by bus from downtown Quebec City to the amazing Ice Hotel, located at Valcartier Village. When you are done exploring the amazing facility, a return transfer takes you back downtown. Enjoy exploring the famous Hotel de Glace located at Valcartier Village tasting some maple taffy and taking in the beautiful carvings throughout. To top off your self-guided visit, you will get to enjoy a handmade cocktail in the Ice Bar in the hotel complete in glasses made of ice! Today marks the last day of your magical winter experience in beautiful Quebec. With fond memories made, enjoy a leisurely morning as you get ready to make your way home. Today your Fresh Tracks Canada vacation comes to an end. A private vehicle and driver will take you from your hotel to the airport in time for your flight. Overnight at the Alt Hotel Ottawa. This property is located in the downtown business district, near shops, restaurants, and boutiques, and just a short walk from Parliament Hill and The National War Memorial. It's appointed with beautiful, bright rooms and thoughtful amenities such as luxurious bedding and complimentary Wi-Fi. Other features include a cafe and a well equipped gym both open 24-hours if needed. Overnight at The Lord Elgin Hotel. This hotel is just a stone’s throw away from the Rideau Canal, Confederation Park and Parliament Hill. Immerse yourself in museums, galleries, eclectic dining, shops and boutiques near by. Just across the canal is ByWard Market and the Notre-Dame Cathedral Basilica. Hotel facilities include a cafe and restaurant, gift shop, business center, cozy lobby with fireplace, pool, whirlpool, sauna, fitness center, and complimentary WiFi. Overnight at the Le Place D’Armes Hotel & Suites. Housed in three 19th century neoclassical buildings, Le Place D’Armes Hotel & Suites is situated opposite the Notre-Dame Basilica and just steps from the Old Port. This elegant hotel features century-old stone walls and thick wooden beams. During your stay take advantage of the complimentary morning shuttle service downtown, enjoy on-site dining options, bar and the rooftop patio, as well as a fitness centre and spa. All rooms come equipped with upscale bath amenities and complimentary WiFi. Overnight at the Auberge Bonaparte. Built in 1886, the auberge is one of the jewels of Old Montreal's hotel scene and within walking distance to shopping, museums and restaurants. Gaze out over cobblestone streets, church spires, and gardens from one of the beautifully appointed light and airy rooms. Enjoy a complimentary breakfast to start your day off right. Overnight at Hotel 71. Situated in Quebec's Old-Port district, Hotel 71 is within walking distance of bistros, boutiques, and historical sites, and has sweeping views of the St. Lawrence River. The boutique hotel showcases 19th century charm on the exterior, and stylish contemporary decor on the interior. Enjoy complimentary WiFi, a fitness centre, on-site dining, and an espresso lounge. Overnight at the Le Saint Pierre Auberge Distinctive. This hotel is tucked away in a 19th century heritage building in Quebec City's Old Port, just steps from the pier promenade. The boutique hotel is ideally situated for easy access to exclusive shops, antique dealers, art galleries, bistros, and cafés. Enjoy complimentary coffee served in the hotel’s library, access to the business and fitness centres, and complimentary WiFi throughout the property. Any trip falling over Dec 15, 2018–Jan 1, 2019 may have limited tour options as some activities may not run every day over the Christmas period. Skating on the Rideau Canal is likely to be available on Jan 10–Feb 17, 2019 departures based on historical opening trends. Hotel de Glace / Ice Hotel Package: The hotel is operational from Jan 3 to March 29th as the temperatures must reach certain freezing levels in order to operate. This trip is available for departures between January and March. based on double occupancy, January 2019 departure and our base class.